Everyone meet Neve Te Aroha Ardern-Gayford, or Neve Gayford for short. The Prime Minister introduced her baby to the world on Sunday. The family, complete with its newest member, left Auckland Hospital after three days there, Jacinda Ardern taking six weeks' maternity leave to "just figure things out as we go". The world's first glimpse of the so-called first baby showed young Neve oblivious to the intense international interest she's stirred - in fact, quite at peace with it all. Ms Ardern said the whole family was "doing really well", but admitted they were "sleep-deprived". 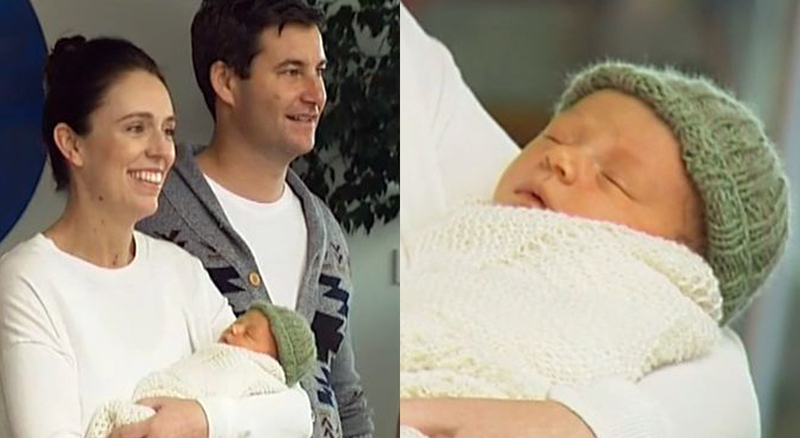 And her partner, Clarke Gayford, revealed the moment that stood out for him in the blur of the birth. "It was pretty special... I won't forget the look on Jacinda's face when she held the baby," he told media. "She looked absolutely just stunned and very, very happy." "Happier than Neve was anyway at that time," interjected Ms Ardern. Much has been made of the significance of this moment - only the second world leader in modern times to give birth while in power. "Hopefully these things that are novelty, still new, one day they aren't new anymore... one day accepted that not just women can but men can too." Ms Ardern said she was blown away by messages she received from other high-profile women - including from the Queen and a note from Meghan Markle. Royal protocol means media can't show that, but Newshub can confirm it's in Markle's handwriting - she trained as a calligrapher. "That's certainly not something you expect, but equally special to us people took time to send a note, blanket or set of booties," Ms Ardern said. Speaking of knitted items, if you were wondering like many on social media about Mr Gayford's choice of cardigan, the Prime Minister clarified in a Facebook Live that the Gisborne op-shop purchase is his "dad cardy". It was the last time we will hear from the Prime Minister for a while as she takes maternity leave. "Over the next six weeks we'll do what every other parent does and learn the little nuances of how Neve wants to work and just figure things out as we go," she said.